So how do you build a company that matters? Companies and people that matter have successfully become the obvious choice in the hearts and minds of their customers, their employees, and their communities. They elevate themselves by consistently finding ways to solve the most pressing needs their markets face. The result? They create more value year after year and build a sustainable, differentiated organization. 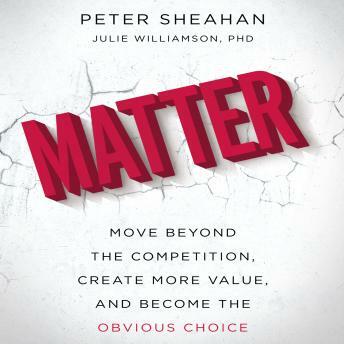 In Matter, Peter Sheahan and Julie Williamson show you how to identify the place where you can create the most value-your edge of disruption-at the intersection of old and new, where your existing profits, reach, and reputation enable you to create the markets of the future. This is the place where the most important problems are solved and where the fewest people can solve them. Your edge of disruption is where your opportunity to matter is found. Matter uses extensive case studies of real companies that have successfully become the obvious choice in their markets-from high-profile corporations like Adobe and Burberry to lesser-known brands like Littlefield and BlueShore Financial. Their stories define innovative and impactful approaches to business that you can use to influence and partner with the right customers and clients to win in our radically changing world. Through their journeys, you will find the inspiration and courage to lean in to complexity and solve the higher value problems that matter most. Don't just listen to this book-use it to identify and act on opportunities to create the most value and accelerate your own journey to becoming a person and a company that matters.